Microsoft Office is ubiquitous in the enterprise these days. We have many years of experience installing and supporting Microsoft Office since Office 97. Office 2013 is the latest generation of the office suite. There are currently many versions of Office 2013, including Office 365 Enterprise. We support and sell ALL versions of Microsoft Office. We employ many tools to troubleshoot hardware repairs. Often, hardware problems are something simple that has failed and doesn't require a lot of time or money to fix. We can check your hardware issues for a nominal charge then give you a quote before any computer or network repair work is done. Slow or broken networks is how we meet many of our new customers. Small business folks don’t have time to read manuals, experiment with solutions, or stay up on the latest technology. So, improperly supported networks that are supposed to make your employees more productive, actually drain time and money. 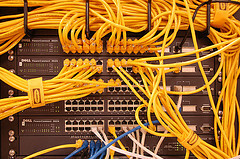 When your network doesn't work, or its performance is degraded, your productivity goes down. Set up monitoring and preventive measures for data, security, and performance.